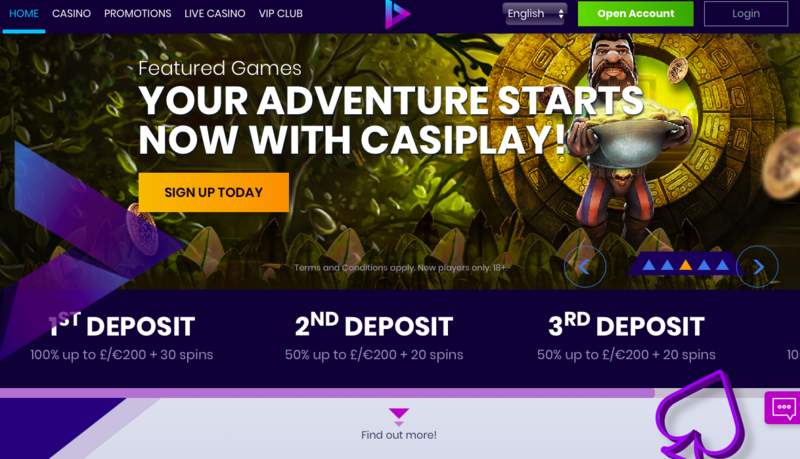 Casiplay online casino was launched in Jan 2019 and is another brand new site hoping it has what it takes to survive and thrive in this hard to crack industry. With all the latest new compliance rules and changes to advertising and bonuses, it’s becoming increasingly difficult for online casinos to make an impact and stand the test of time, so let’s have a look at Casiplay and see what it has to offer. Let’s start with the logo which is so simple, yet very effective. It’s a triangle on its side, like a ‘play’ symbol from a stereo. It also reminds you of those old Maxwell cassette tapes which fits perfectly with the Casiplay name and brand. When you click into the different sections of the site, you also get the same logo as the page loads up and the overall feel of Casiplay is that it’s a well thought out, cohesive site. 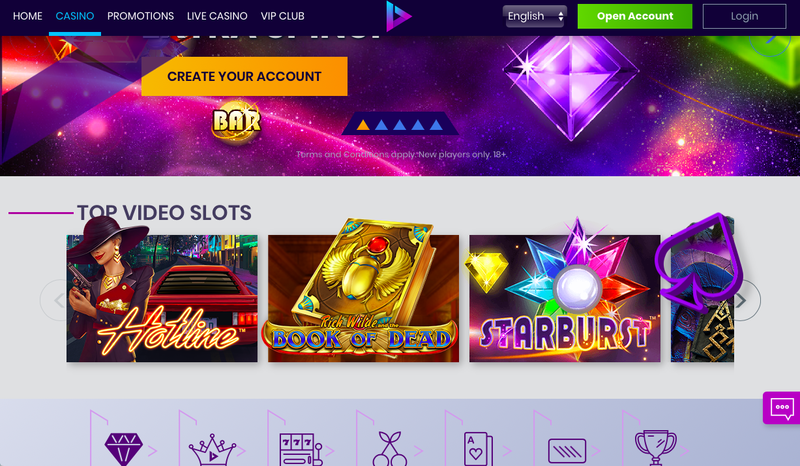 There is no obvious theme as such, but the design is a classic, dark purple and blue layout, with previews running in the background of slots, reels and live casino. The graphics look great and first impressions are that it’s a good user-friendly site. Along the top are links to the main casino games, promotions, live casino and the VIP area and there is also a live chat option and several other language options to choose from. Further down on the homepage are more game previews and although there’s a lot going on, it doesn’t feel cluttered or overwhelming at all. If any improvements could me made it would be the scroll bar at the side; it’s very thin and extremely difficult to grab in order for you to move up and down. It can be quite frustrating trying to select it and you often end up clicking in the wrong area. With an impressive design, you’d expect an impressive list of software providers and you’re not disappointed. NetEnt, Microgaming, NYX Gaming, Quickspin, Thunderkick and Play’n Go are some of the developers powering the site and as a result, you’ll find some of the best slot games, new release titles, classic slots, table and card games and a really great live casino section. In the live casino, there are several different options for popular games such as Roulette and Blackjack and again, this area is really easy to navigate and is clearly set out. Click on the casino tab which takes you to all the slots, scratchcards, classic titles, new releases, featured games and table and card games. In here you’ll find familiar titles such as Thunderstruck, Gonzo’s Quest, Starburst and Aloha! Cluster Pays. Again, there’s a lot of content but the layout feels fresh and modern and not confusing in any way. With licenses from the UK Gambling Commission, Malta Gaming Authority and Alderney Gambling Control Commission, anyone visiting Casiplay can feel reassured that all the necessary guidelines and compliance has been adhered to. You can also play on mobile devices so anyone that enjoys playing on the go will love this feature. Crediting your account is straightforward as Visa, Neteller, Mastercard, Entropay and Skrill are all accepted. But it goes without saying, you may need to provide proof of identity and further documentation when making a withdrawal. Let’s be honest, there are other sites out there that really break the mould in terms of unique themes and design. However, Casiplay have executed their design and branding really well and that is what will appeal to both experienced and new players. It feels fresh and inviting while at the same time, feeling like a classic casino site. Casiplay is packed full of superb games, has a VIP club for loyal players and a great welcome offer for new members. Always check the site for the latest offers and promotions. If you haven’t already, check out Casiplay as it’s definitely a strong new contender and one to watch!